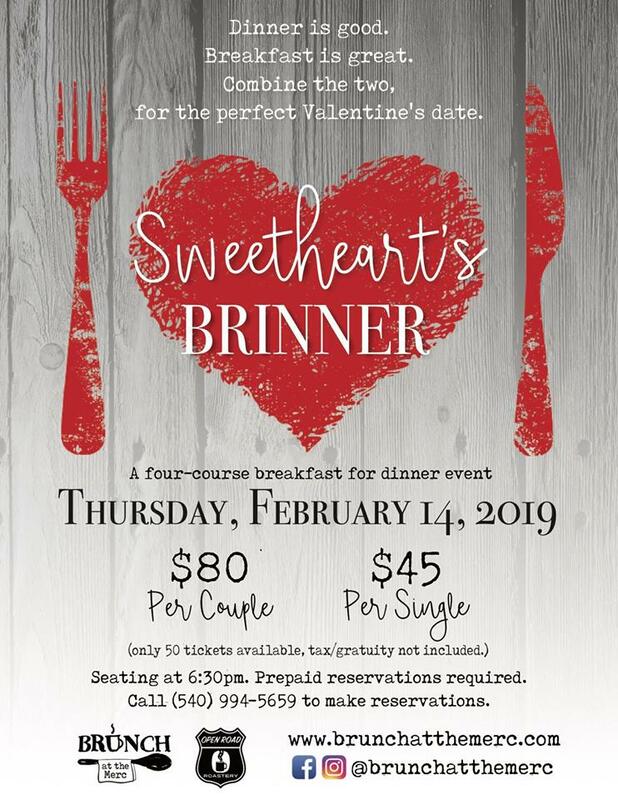 Draper Mercantile and Trading Company presents Valentines Day "Brinner" at Brunch at the Merc on Thursday, February 14, 2019. Enjoy a sumptuous, four-course breakfast for dinner event hosted by BRUNCH at the Merc and Open Road Roastery, and complete with live music by Melanie Robinson. Held within the historic Draper Mercantile, this relaxed, intimate evening will showcase the amazing layers of flavor you've come to expect, but available in a special dinner event. Treat your sweetie, your best friend, your favorite family member, or even yourself, love knows no boundaries! The cost is $80 per couple or $45.00 per single, plus tax and gratuity. Reservations are required and very limited, so call 540-994-5659 extension 1 to secure yours! Note: Only 50 tickets are available. To view the event flyer, visit: https://i.imgur.com/nMbljOV.jpg.